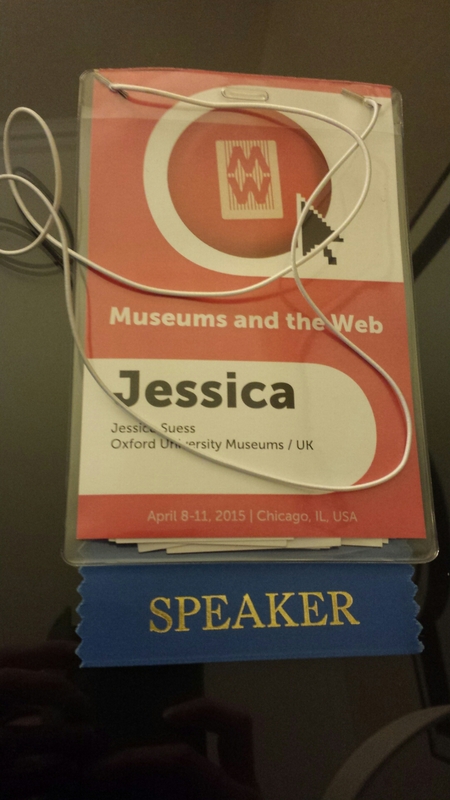 This year, I was fortunate to be able to attend the Museums and the Web conference for the second year running. This is the largest digital conference for the museums sector, but it is difficult to wrangle attendance as it is in the US, this year in Chicago (you can read about the rest of my trip to Chicago here), which means, despite tickets being good value, attending can be very expensive. My penance (and reward) was to present a paper: Mobile Bouleversement in which I explained how we transformed our in museum mobile offer over a period of 8 months by installing free public WiFi and building a new mobile resource for our onsite visitors – you can read my full talk here. This is such a valuable conference, both in terms of networking and discussing key issues with hundreds of colleagues from across the sector who are working in the same zone and tackling the same challenges, and just cramming as much up to date information and new ideas in my brain as possible through the fantastic talks, workshops and discussions. It is difficult to share the amazing experiences and lessons from the many networking opportunities – though I can tell you that karaoke is a thing for this demographic – but I can share highlights from the many excellent sessions I was able to attend. I hit the ground running with my first session of the conference on evaluating mobile – particularly relevant as we move forward with our in museum offer, evaluating and improving the experience for our visitors. First up was Shelley Mannion and Will Robinson from the British Museums sharing what they have learnt from a six week research project evaluating use of their multimedia guide (with the caveat that visitors still very much think of the service as an audio guide with the term multimedia guide carrying little resonance). 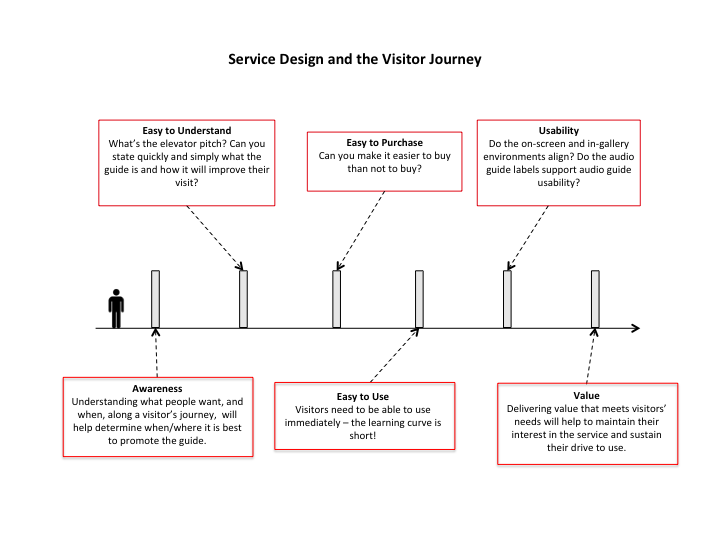 The two key questions: how do visitors use services like the guide, and can uptake be increased? You can read their full paper here. The key take away for me was around how we think about visitor motivations. The British Museum team found that traditional audience segmentation was not as useful as it could have been, focusing primarily on an individual’s motivation for visiting a museum, but not how their behaviour and motivation changes throughout their visit. For example, many people visit the British Museum with a list of key highlights they want to see, but once they have done those (which might take only 20 minutes) then what, what do they want then, how will this change their behaviour? This is a a key moment of opportunity on the visitor journey. The British Museum team identified a different set of attributes to describe visitor behaviour during their time at the museum, and which influenced visitor uptake of the guide. Interviewer: Will you take an audio guide? Visitor: No, I don’t have time. Interviewer: How much time do you have? 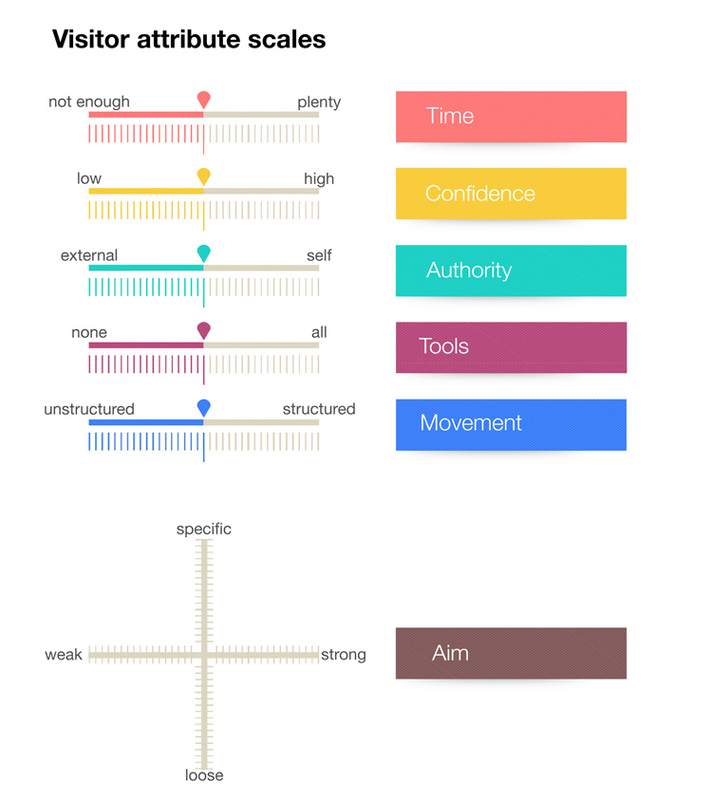 The British Museum team found that time, confidence and authority were the primary influencing factors of guide uptake – individuals confident in using museums and in their relative authority on the subject matter are significantly less likely to take up a guide. I can’t wait to see how the British Museum use this information to improve their guide – both the product itself, and how it is communicated to their audiences. Presented by Laura Mann from Frankly Green and Web and the Met’s Grace Tung, they conducted a major evaluation of the museum’s audio guide, looking at the role the guide plays in the visitor journey. By focusing on the guide as a service rather than a product, they were able to examine it in a new light. For example, the Met has done great work making sure much of their guide has been translated into multiple languages (at both the Met and BM, uptake of the Mandarin guide has overtaken that of the English guide). However, users of the Mandarin guide regularly reported a lower satisfaction with the guide. This was because while there are 2,600 stops in English, there were only 50 stops in Mandarin. While this still represents hours of content, it meant that as they traveled around the museum, they were also very aware of the content that was not available to them. The Met is now investing in a significant translation programme to dramatically increase their multi-lingual content. Interestingly, they found no evidence that better technology, or fancier content formats – such as video – had any impact on uptake or satisfaction with the guide. In particular, visitors only appreciated video content when it added something significantly additional to the audio. You can read their full paper here. The final talk in this session from Scott Sayre from the Corning Museum of Glass was great, as we are also looking at ‘bring your own device’ as a key model for our museums. Corning Museum has invested significantly in the infrastructure to support this service, in terms of Wi-Fi, network boosters, charging stations and an entire mobile accessories section in the museum shop. This was great to hear, as I think too often museums think of BYOD as a cheaper alternative to providing devices. He also pointed out how BYOD is a very different experience for visitors. While museum guides are now a staple of the experience, many people do not think of museums as a device location – it is necessary to make people aware that it is, and that there is content available for them to access. This can’t just been on arrival, but needs to be at key points throughout the visit, as unlike guides which hang around a users neck as a constant reminder of their commitment to that content, an users own device sits in the pocket, only to be pulled out when something prompts its use. You can read his full paper here. The session on Digital Collections was great, with the Dallas Museum of Art, Tate Britain and the J. Paul Getty Museum discussing their efforts to streamline their digitisation workflows and unify their collections management systems. To the envy of many, Shyam Oberoi, Director of Technology and Digital Media at the Dallas Museum of Art revealed that they had received generous funding to digitise their full collection to enable better online access, and they shared their methodology for achieving this over a 3 year horizon (they are currently ahead of schedule). It was great to hear them place an emphasis on the need to properly staff the operation, hiring not just photographers and metadata experts, but additional registrars and art handlers. They also emphasised the importance of well planned workflows, planning well in advance and photographing objects in sets based on size, material and location. 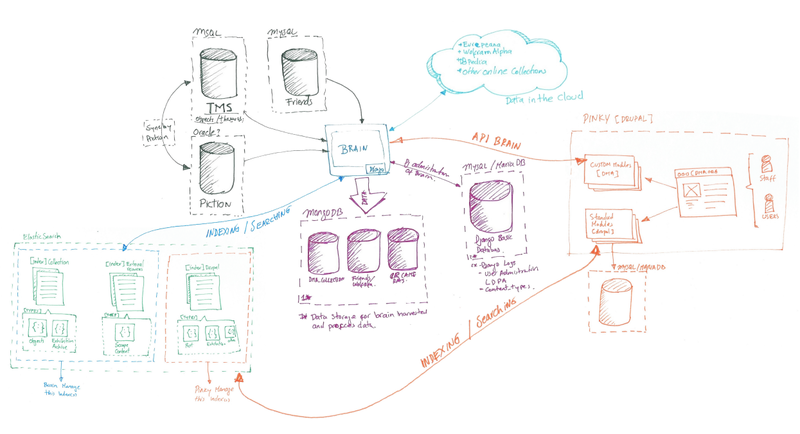 Shyam and Kristen Arnold (Senior Software Engineer) described their experience of introducing a new Digital Asset Management System (Piction), which seems to have an intuitive interface to linking to the Collections Management System (TMS). With these two internal content silos in place, they set about scoping a content aggregation and dissemination framework, coming up with the Brain. You’ll have to read their online article to get an idea of the Brain and how it works, but before the launch of the new collections site in 2014, less than 1% of online visits engaged with this content. Now 15-20% of traffic to their website is to their online collections – an impressive statistic. Next Emily Fildes and Allison Foster from Tate Britain also shared their approach to digitisation workflows. They received funding from the Heritage Lottery Fund to digitise a portion of the archive, but used that as an opportunity to put new workflows in place that would support future digitisation activity for the rest of the collection. A second key aim of the project was to boost the discoverability of the archive by integrating search of the archive with the significantly more popular collections search – though they called the archives ‘art and artists’ since user testing demonstrated that users did not interpret the term archive in the same way that it is used professionally within museums. This represented significant challenges, not only in terms of integrating two distinct data sets, but dealing with the the anomalous search results this would return, with the archives swamping searcher for some artists. 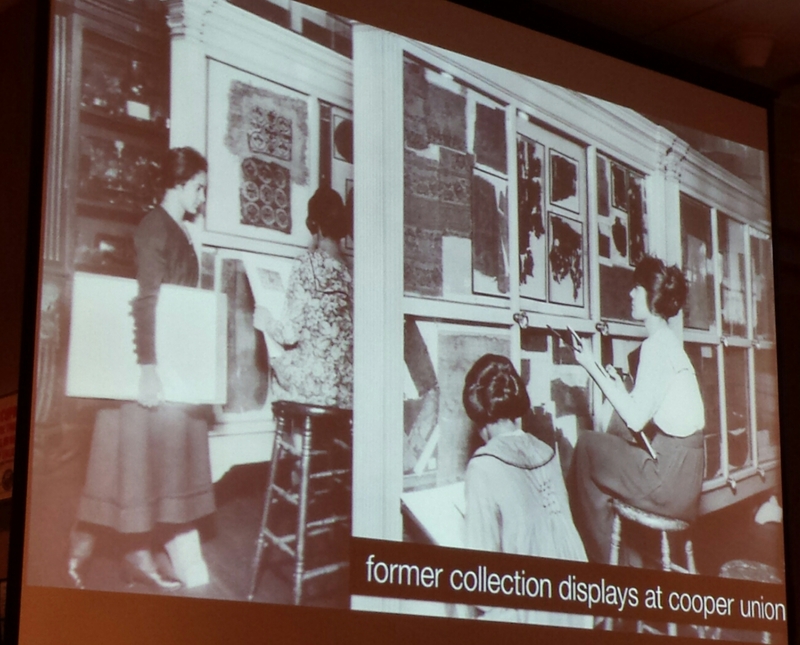 Their solution was to present individual archive pieces as in page slide shows. The pair also made various interesting references to their online audience insights produced by their digital analyst, Elena Villaespesa who also did an interesting session at the conference on Finding the Motivation Behind the Click which unfortunately I missed. I know Elena also emphasised in her talk the importance of sharing stats with staff – something I’d like to do more of here. Read Emily and Allison’s full paper here. Rounding out the session Daniel Sissman shared the details of a project to research, design and develop an entirely new open-source collections information infrastructure for managing, authoring and delivering collections information and related data to downstream applications. Read his full paper here. This is always one of my favourite conference sessions, since examining and critiquing other sites is always such a great way to think differently about our own offer. All the sites looked at this year were really good! First was Apprentice Architect from Fondation Luis Vuitton, an interactive app developed for 12 year olds as a bit of a babysitter. The games, while simple, were really engaging – I spent a little too long playing the Where’s Frank game as they passed around a tablet for us to try. Check out some videos of the app here. 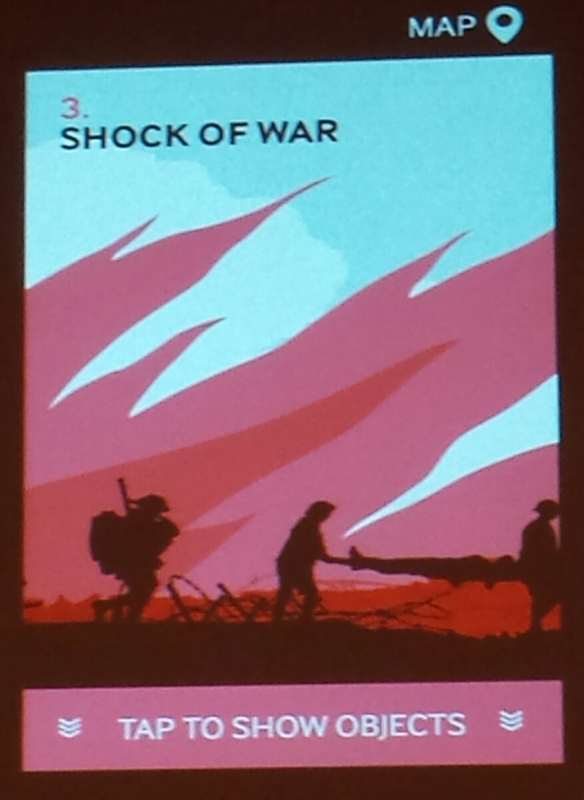 Next was the Imperial War Museums touring exhibition guide app. This was lovely. The visuals of the app were very nice, and it made good use of iBeacons, locating the device to a room with a theme, and then allowing the user to explore the content on their own. The content was also very compelling. They took the stories of 8 individuals during the war and wove it into the exhibition, so when you went to an area of the exhibition with a general theme, through the app you can hear personal stories of an individual who you chose at the start of the exhibition – exerts from letters etc. At the end of the exhibition there are some large screens and you touch the device to one of the screens to say you have finished, and it brings up a video of your character, and you meet one of their ancestors, who also voiced all the recordings. A really nice experience. Next was the Clark Museum Multimedia Guide, which was quite a staple museum multimedia guide, with a few interesting AR editions, but it was executed very well, and the crit was informative, especially around how people use it. The guide had lots of layers of information, with the most interesting interactives at the bottom, but it is less clear how people know that it is there and access it. Read about the Clark guide on the Art Museum Teaching website. 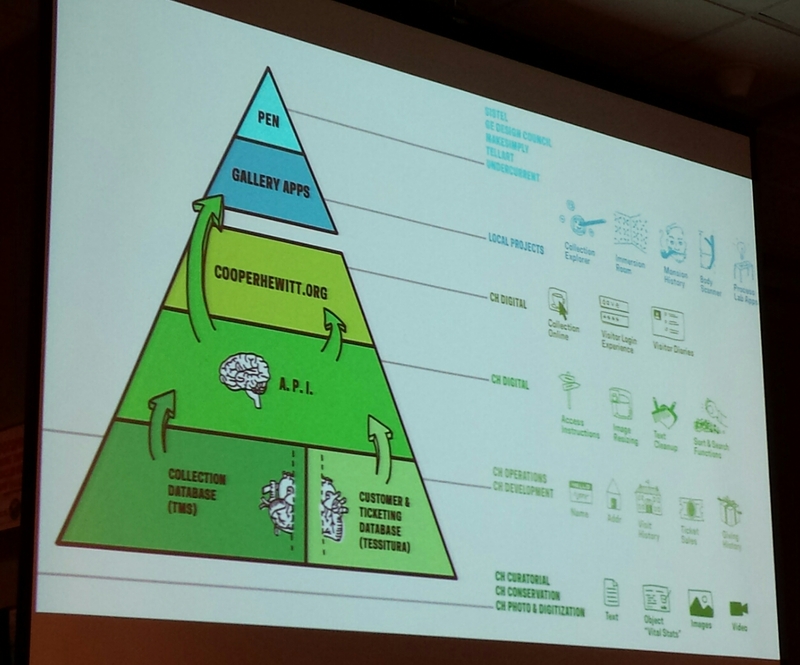 The final item was something called Social Augmentation at the Rijksmuseum, a one year research project at the museum. The idea was that in addition to listening to additional content about objects, the guide offered you the opportunity to ‘overhear’ the conversations of other visitors about certain objects. The first of these audio snippets were collected by the project team through interviews, but visitors using the app can also upload their own audio recordings for moderation and to be shared. The app is only in prototype, but the idea is to incorporate this feature into the museum app. It seemed to offer an interesting new way for people to engage with collections, which the project team felt could be very valuable for a museum like the Rijksmuseum which many people visit when them come to Amsterdam as a must see, but aren’t sure how to engage with. It will be very interested to see how they manage to get people to leave content that is of genuine interest to other visitors. Interestingly, all these ‘mobile experiences’ were delivered primarily on devices provided by the museums (even if they were also available for download). Discussions around this really highlighted what a barrier having to download an app can be, especially if someone needs to do extra things such as turn on bluetooth. Having to deal with these issues can remove some of the ‘magic’ of the experience for the visitor. Having just launched Wi-Fi in our museums and looking at developing mobile resources, I was very interested in the discussions around indoor positing technology, and how we might be use it to better deliver content to our visitors, but also better understand how they use the museums and their pathways through the collections. So first up I attended the Professional Forum on Indoor Positioning, and there are some really sophisticated things happening in the sector. The Exploratorium are using iBeacons, which are very popular at the moment, but only really give an accuracy of 5-10 metres, and can’t tell which way you are facing, which can be difficult in some contexts. Wi-Fi triangulation suffers from similar issues. The Hatfield Marine Centre are using video observation and facial recognition to track their visitors – very interesting, very effective, and very creepy! Both of these can work at display level, but in terms of tracking what individual objects visitors are engaged with, the Cooper-Hewitt seemed to have this cracked with the pen, which compelled me to attend their session on the pen later in the day. The pen is great on the granular level, with people physically checking on on objects that they engage with. It provides a great source of analytics for the museum as well since they have an 80% uptake rate – the pens are handed out on arrival, but aren’t given to under 6s, school groups, and sometimes families will not take one each, plus the occasional visitor who is adamant that they do not want one, but then see people using them in the galleries and often return and want one. I followed this up with a more technology based session on indoor position – Wherefore Art Thou. This was a really useful practical session on the different iBeacon options – battery life, positioning, platform limitations, etc. If you are thinking about doing something with iBeacons I recommend you check out the papers from this session, especially the one from the Indianapolis Museum of Art where they share the details of their testing of various iBeacon options. 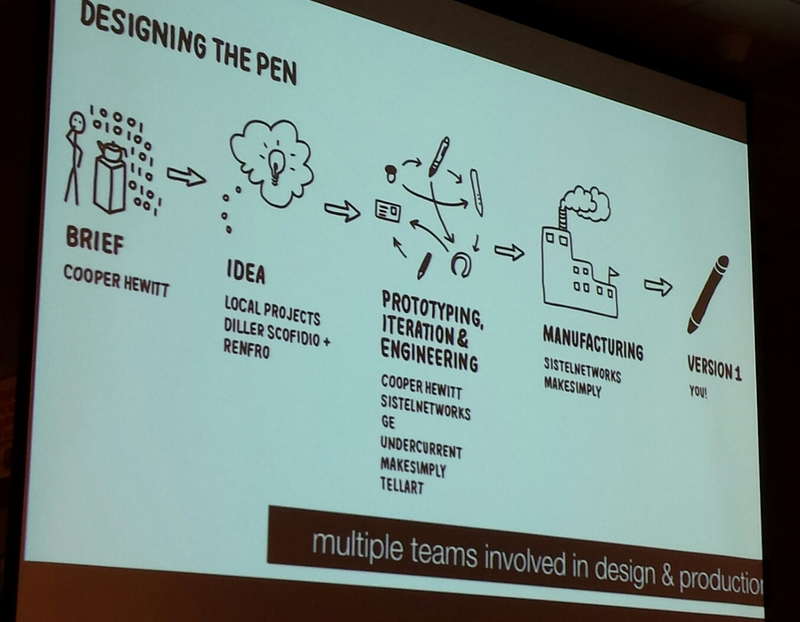 This session on the development of the Cooper-Hewitt pen was fascinating, both in terms of how they developed the pen and the supporting back end, and their candor about the many challenges they overcame, and still face (it’s great to see a slide that says OMG WTF ???!). The pen itself they had to manufacture from scratch after the conceptual idea of the pen was picthed by a design company doing some blue sky thinking. The idea was that the pen would take the museum back to its roots as an active design teaching space. But at that stage the pen was just a conceptual idea, and there was not technology available to deliver it – this had to be designed and manufactured by the museum. In the end it was quite a simple tool, all it does it bookmark stuff, but it does it well. Impressively, so far they are seeing 30% of people log onto the website to see what they have bookmarked within 3 days of the visit. More impressive, however, than the pen itself is the ecosystem around the pen. Preceding the development of the pen was significant work to develop an API for the museums’ collections, which powers the website, gallery apps and pens as a coherent whole. Alongside these highlights, there were other interesting sessions on agile working and how to be a museum leader – definitely worth browsing the conference programme and checking out some of the papers. There were also the annual Best of the Web Awards, and lots of social spaces to meet new people and discuss new ideas. Thanks for another great year! 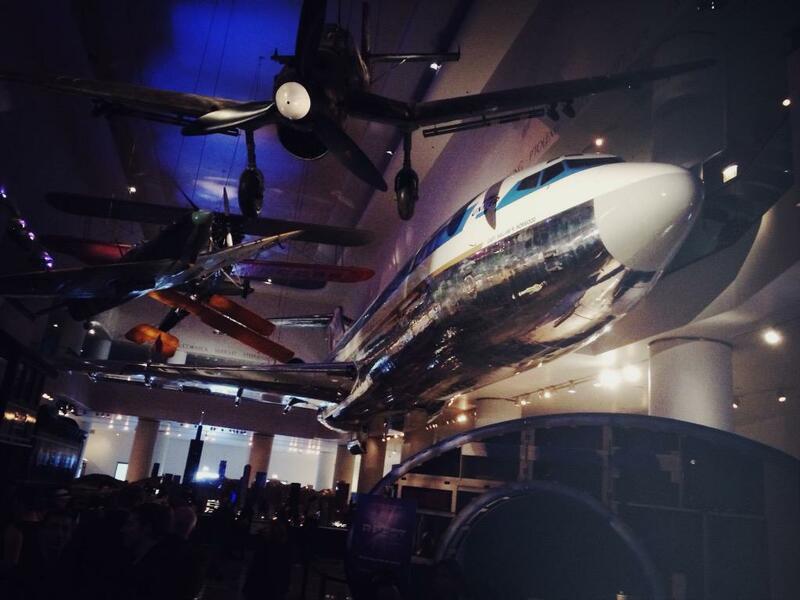 This entry was posted on April 24, 2015 by Jessica Suess in Uncategorized.